Weakened public institutions, military reform, and public opinion in the face of rapid change have opened the door for corruption, inequitable distribution of burdens, and political instability in South America. Countries in the region are facing painful and sometimes dangerous reform. 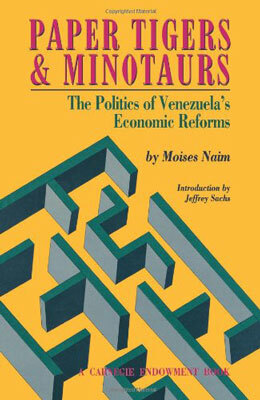 Based on Moisés Naím's experiences as Minister of Industry in rapidly changing Venezuela and as Executive Director at the World Bank, this book raises questions and explores problems crucial to political and economic reform. Dr. Naím grapples with entrenched interests bent on derailing reform, the corrosive effects of corruption, the inequitable distribution of burdens, political instability brought on by weakened public institutions, military reform, and public opinion in the face of rapid change. After the revolutionary political and economic changes of the 1980s and early 1990s, the countries of South America—and many other countries all over the world—are facing painful and sometimes dangerous reform. Dr. Naím's book tackles the subject of managing that reform. “The story is well-told and the lessons valuable for those interested in under-standing, as well as making, economic policy."